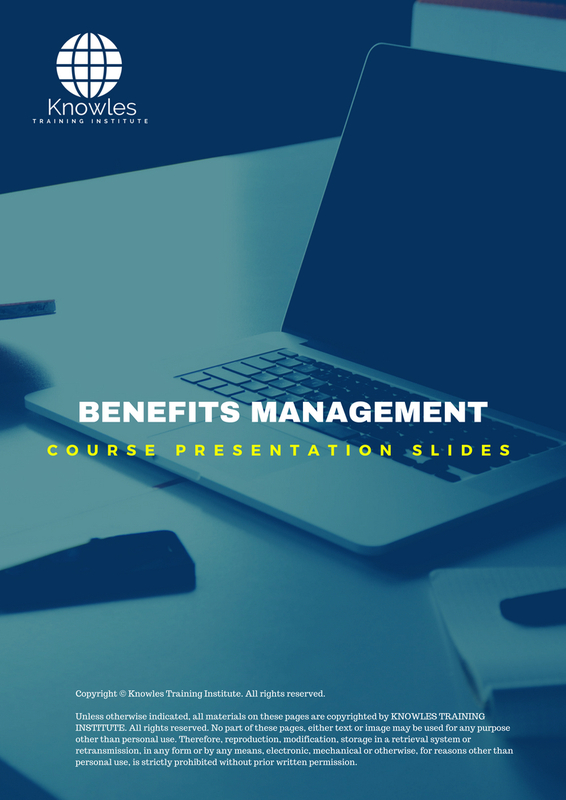 Benefits management, also known as benefits realization management, is a tool for managing and maximizing benefits out of a business project or program. As the name suggests, it is centered on the outcomes, which are the benefits, that is incorporated in every step of the project, making sure that they are still in line with the business strategies being employed. 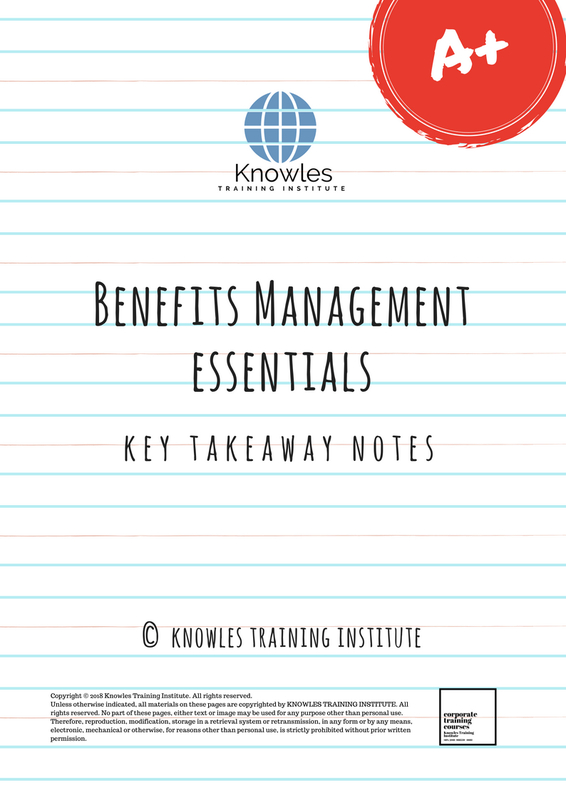 Benefits management is one of the detailed and structured instruments being used to direct effective changes in a company. It is of the general opinion that benefits management is one of the most difficult tools to use in business. One of the reasons is that benefits may be difficult to identify or quantify. Hence, formulating a benefits management framework needs complete knowledge of the project and the whole business case. Benefits come into fruition through analysis and change implementation, which then implies that a project has been successful in its delivery. 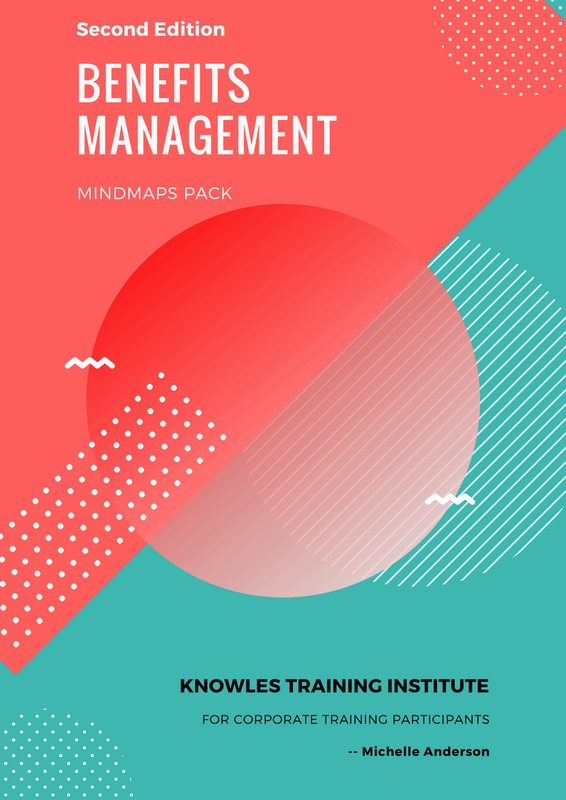 This course will introduce the participants to the complexities of benefits management and its importance in the grand scheme of maximizing value for a worthwhile change or investment. 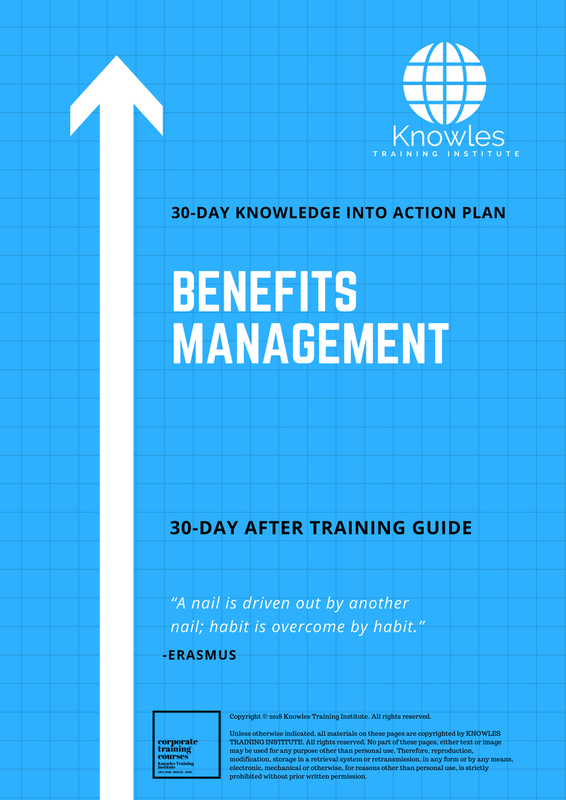 This Benefits Management workshop is ideal for anyone who would like to gain a strong grasp and improve their Benefits Management. The duration of this Benefits Management workshop is 1 full day. Knowles Training Institute will also be able to contextualised this workshop according to different durations; 2 full days, 1 day, half day, 90 minutes and 60 minutes. • Introduction: What do benefits mean in business? • What is the definition of benefits management? • What is the importance and purpose of benefits management? 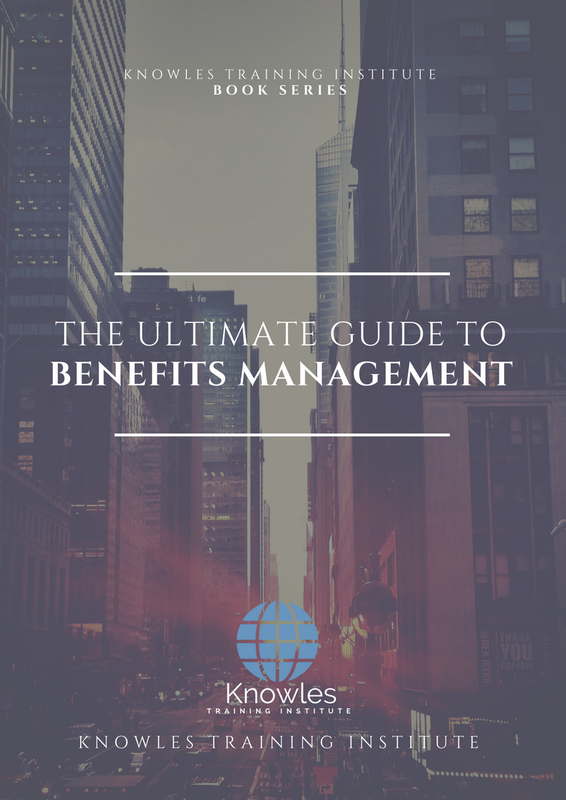 • Who are the people involved in benefits management and what are their responsibilities? 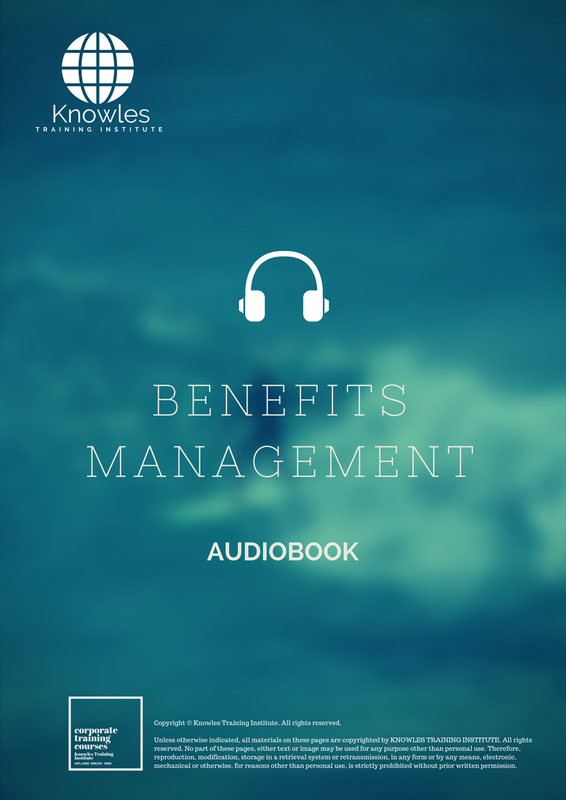 • What are the concepts and principles involved in benefits management? • What are the steps to follow in the process of benefits management? • What are the major challenges encountered in benefits management? • Activity: Make a benefits management framework out of a given case study. 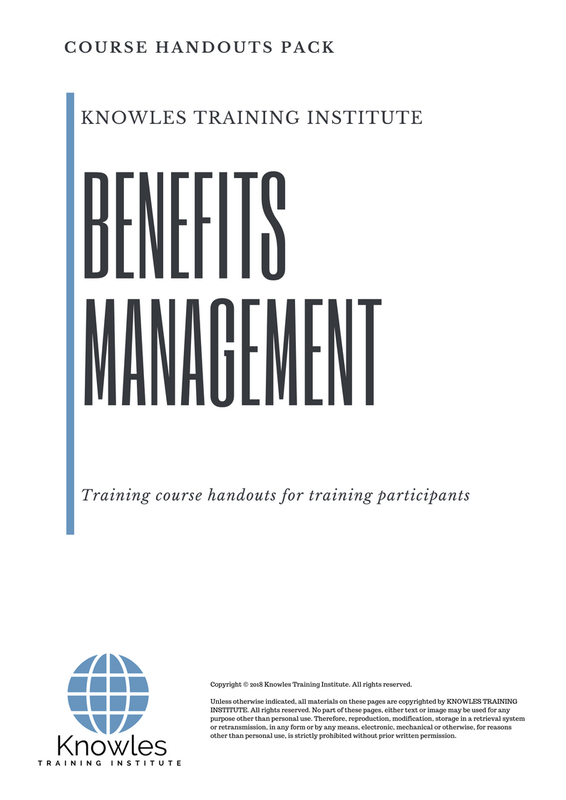 There are 3 pricing options available for this Benefits Management training course. 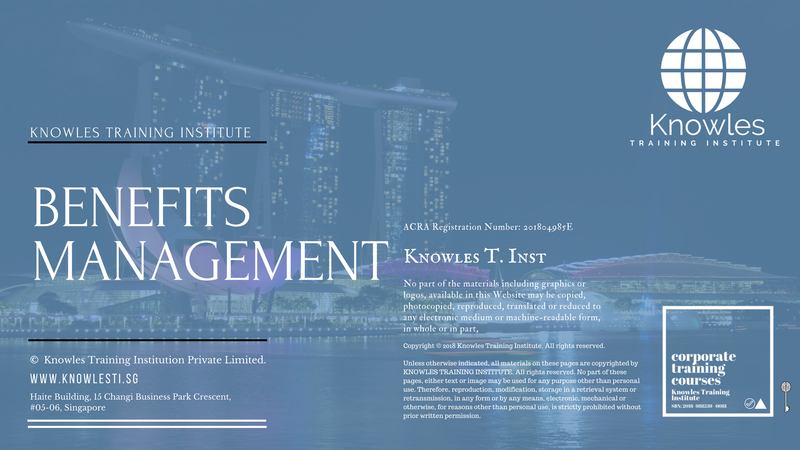 Course participants not in Singapore may choose to sign up for our online Benefits Management training course. 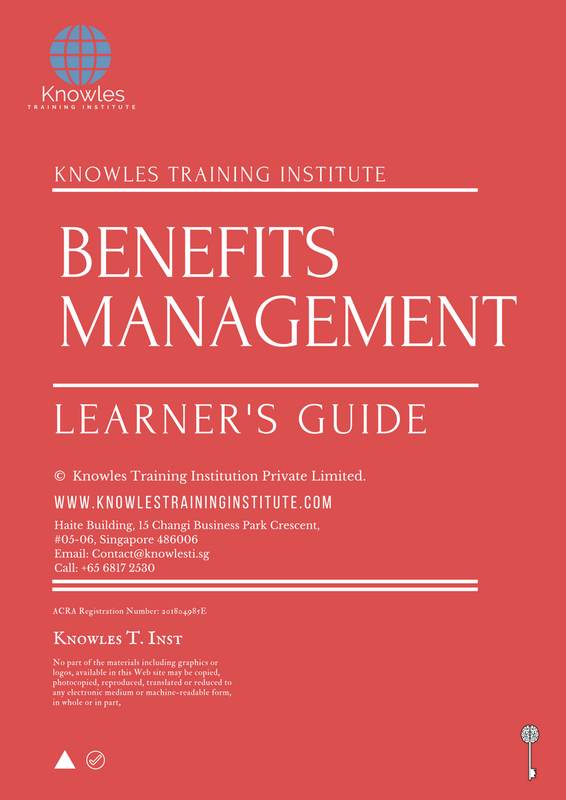 Request for this Benefits Management course brochure. Fill up the short information below and we will send it to you right away! 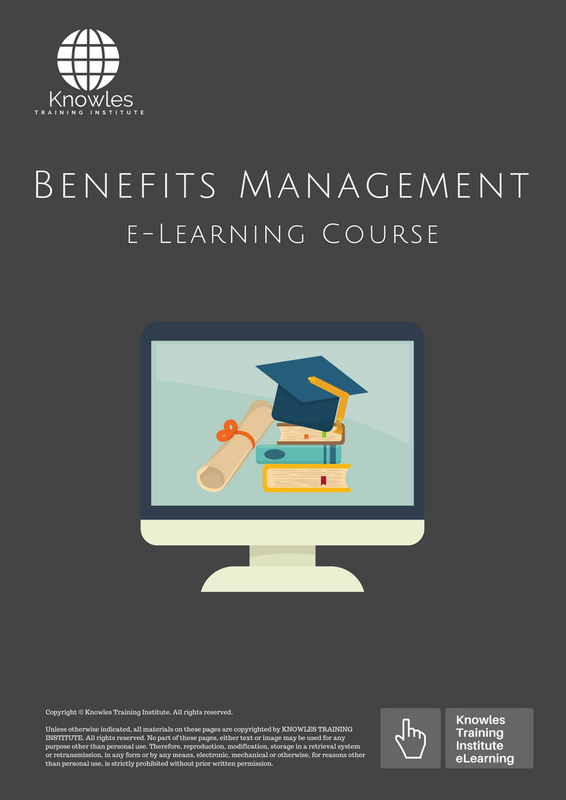 Register For This Benefits Management Course Now! 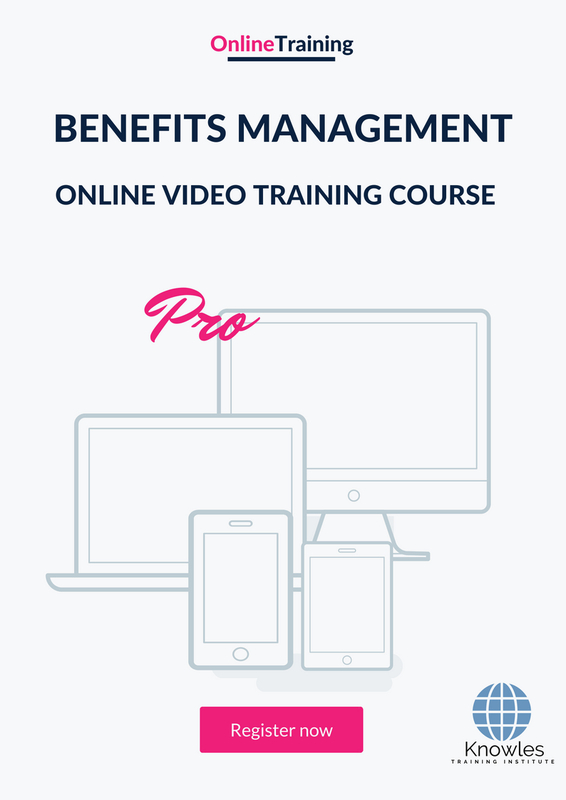 Share This Benefits Management Training Course! Benefits Management course, workshop, training, class, seminar, talk, program, programme, activity, lecture. 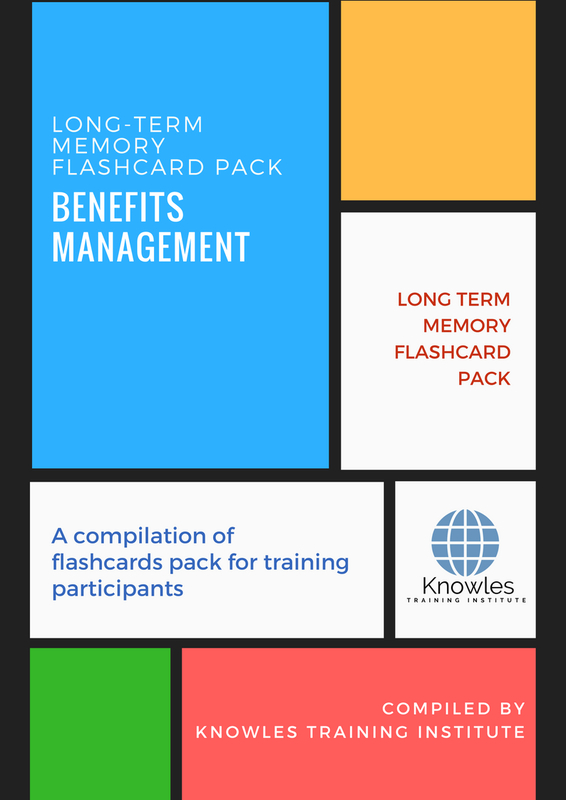 Benefits Management courses, workshops, classes, seminars, talks, programs, programmes, activities, lectures in Singapore. Benefits Management improvement tips, Benefits Management techniques, improve Benefits Management, improve Benefits Management games, Benefits Management improvement exercises, improve Benefits Management power, how to have good Benefits Management, how to have good Benefits Management in studying, how to build up your Benefits Management, how to improve Benefits Management how to improve Benefits Management course in Singapore. Enhance, boost, build up, enlarge, heighten Benefits Management course in Singapore. Increase, intensify, raise, reinforce, strengthen Benefits Management. Upgrade, amplify, boom, elevate, exaggerate, magnify, grow, gain Benefits Management. Develop Benefits Management, multiple, power up, beef up, bolster, establish, extend Benefits Management. Invigorate, restore, step up, toughen, empower, fortify, regenerate Benefits Management. Rejuvenate, renew, escalate, expand, maximize Benefits Management. Powerful, mighty, impressive, competent, great, excellent, exceptional Benefits Management in Singapore. Superb Benefits Management. 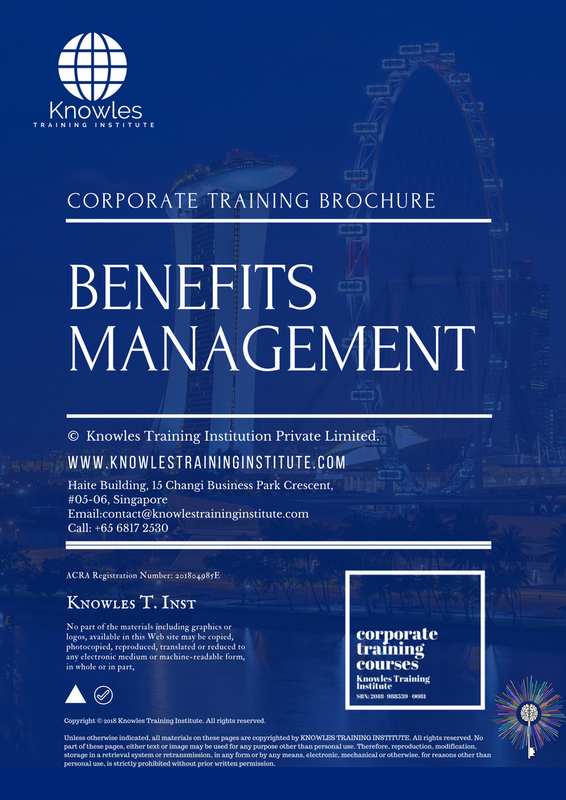 Super, superior, strong, solid, active Benefits Management training courses and workshops in Singapore. Benefits Management enhancement, booster, building up, enlargement, heightening, increment, strengthening, amplification. Benefits Management magnification, growth, development, power, empowerment, regeneration. Benefits Management rejuvenation, development, escalation, expansion. Benefits Management maximization, power training courses & workshops in Singapore.